Bali is known for its surfing and swimming and its many beaches are popular spots for tourists who are into the beach or surfing scene. 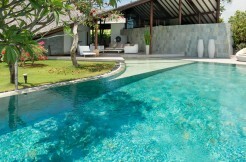 Anyone who loves surfing needs to book accommodation at one of the luxury Bali villas that are close to the beach. Then they can step out at daybreak and ride the waves even before breakfast. Not all beaches in Bali have good surfing waves. Some are more suitable for families, with young children being perfectly safe splashing in the shallow, calm waters. Others are good for confident, strong swimmers who prefer to be in the water rather than on a surfboard. Here are 7 of the best surfing beaches in Bali. Uluwatu on the southern tip of Bali is a paradise for pro surfers; due to the world class waves many international surfing competitions are held there. Competitors come from many countries to participate. In the surrounding area, Padang-Padang is known for its long, barrel waves and 8-metre high breaks that all pros dream of. Blue Point, Sulaban, Bingin and many more in this area offer fine waves for surfers who know what they are doing. Keramas Beach is another great surfing spot. 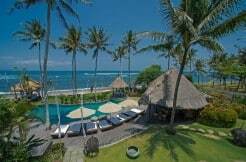 It is located 2 hours from Kuta on the east coast of Bali. This beach too, is used to host international surfing competitions. Kuta Beach is famed for many things, not least being its waves. Many surfers are taught the art of surfing on Kuta and nearby beaches and areas including Padma, Kuta Reef and Halfway. Due to the variety of waves, the area is good for beginners while still offering pro surfers breaks that satisfy. Around 30 minutes drive from Kuta Beach you’ll find Canggu Beach. This beach is more suited to experienced surfers who know how to handle dangers such as rips and strong currents. Beginners should stick to the nearby Batu Bolong Beach. With plentiful accommodation, Canggu is extremely popular now, being seen as the cool place to be by many surfers. Surfers from Japan especially, seem to love Serangan Beach, famous for its long rolls and plentiful breaks. In the wet season when there’s no surf at Kuta or Canggu, you are sure to find great breaks at Serangan. The bumpy road into it is well worth the effort. If you don’t mind picking your way over rocks, Medewi Beach in the Jembawi district has long rolls and fewer people – that make it popular with longboarders. Arrive early to get the best waves. Balian Beach is similar to Medewi and also on the west coast, though only two hours from Kuta Beach. It is a popular spot for longboarders and the many international surfers who enjoy its waves.